Stunning Keisha: A Special Offer Just For You! Derek Jeter doesn't have anything on this little ghetto kitteh! I'm a pro now, with my own trading cards to prove it. 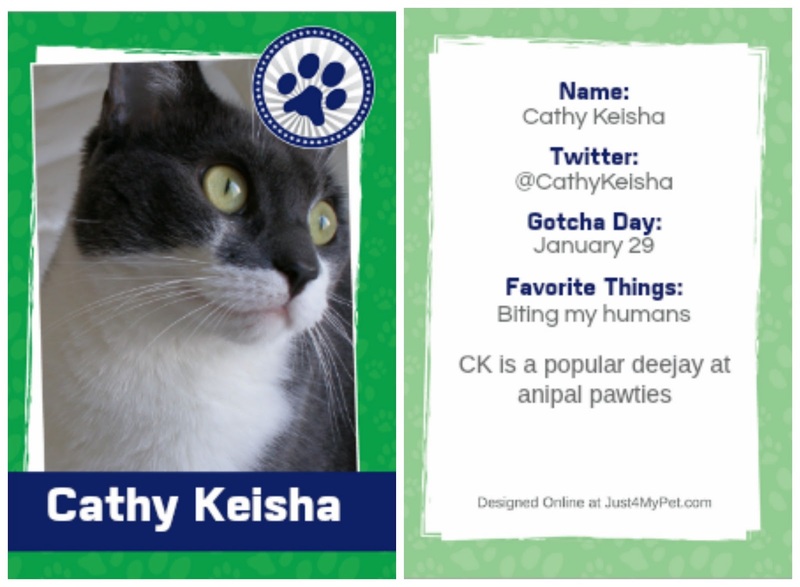 As if my ego isn't big enough—no smarty-pants remarks from the cheap seats—I just got my own trading cards thanks to Just4MyPet.com! A superstar such as myself needs trading cards! My mancat Parker's Mom offered to make a set for me and I jumped at the offer. Sincere thanks to Wanda. Her cards came out way better than TW's. OK–OK, TW designed them both. 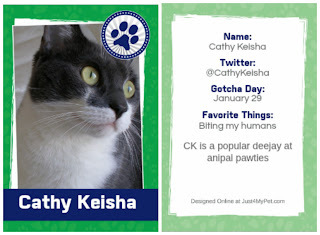 Besides trading cards, Just4MyPets.com has lot of cool swag that you can customize with your own photos. Items like calendars, shirts for you or your human, photo jewelry and more. Click on the link and head over there. You can browse their cat furniture and have your human spoil you with a cool Italian leather collar with Swarovski crystals. While you're there, don't forget to take advantage of their FREE Personalized Pet ID Tag offer. 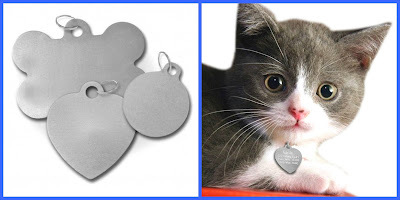 These tags are made of silver aluminum and you can choose one of the 3 shapes in the photo below. They comes in different sizes and include the split ring to attach to your collar. Shipping on orders over $49 is always free and $1 of every purchase goes to Pets in Need. Disclaimer: I received these sets of 10 cards free but no legal tender exchanged hands and every word here is my own. No one tells this ghetto cat what to say. Cool Keisha. Have a terrific Tuesday. CK, your trading cards are terrific! The mom saw these at BlogPaws and was gonna get us some, too. Very cool CK. I like the green ones. Those are very nice trading cards. My favorite thing is Biting My Mommy! MOL. That is such a great idea. ! Darn if those aren't CK Cool!!!!! hay, thanx for de code...we will chek out this site.....we wood look good on cards we think !! Cool cards CK. M is trying to make up her mind if she'll get me some or not. I still has a few TokoPoki ones left. Anyway, you look good sweetie. 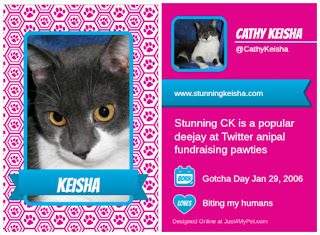 Those are pawesome trading cards! We love the favorite thing being biting TW. You sure don't give her a break, do you? MOL! Hey, those are pawsome! *sigh* Mom supposes all the cool cats will want to have those now. MOL! Now THAT is way too cool! Thnx for telling us, now all me has to do is steal Mommy's VISA when she is at the market and mes could be all galmmed out! Hey! Human!!! I want a set of these cards, dammit! And don't give me any of that "I'm too busy" claptrap you say about everything these days! Nice! Moosey got some trading cards, too, CK! We have to do a post about these, too ... so much fun! Nice! Love the trading cards CK! What a neat idea! We really like your trading cards, CK. Heyyy... what's this about a mancat?? I love your cards! Favorite thing..biting my human. LOL! That site sounds wonderful. I will go over and check out :-) Thank you for the link! those look great but I got my trading cards from Toki Poki!! Love 'em but yours are great too! Love your post! I have a strong feeling you are getting way more done than I am. I sure enjoyed meeting you at BlogPaws and hope you go again next year. I sent your address on, and the man in charge said he will ship your Cabana out of Thursday. He was travel, so there will be a slight delay. Hi darling CK, My Human is being absolutely USELESS these last few days. It always gets like this at the end of the school year....sigh. Maybe she'll pay more attention to me on the weekend? But I'm not holding my little breff. COOL trading cards C.K ! !